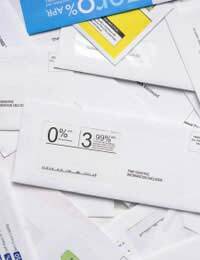 Have you ever considered why you receive so much unwanted mail - especially mail from companies you have never heard of before offering you discounts and offers for products you wouldn't possibly have a use for? If you have received such unwanted - and from your own point of view - completely unnecessary information it is possibly because you haven't ticked the box. When you send off for something say from a magazine or a brochure that has been delivered to you there is an option to tick the box to tell the company you are contacting that you are not interested in receiving information from any other organisation. This is called Third Party Advertising and is a practice that has been in operation for some time. Ticking the box signifies that you do not wish to have your details passed on to any other company, organisation or individual who may use those details for the purposes of unsolicited marketing or advertising. For a long time such companies did not have to tell you what they did with your details when they got hold of them but changes in the law have made it necessary for them to tell you what they can do with them unless you specify differently. Third Party Advertising is - as we have briefly touched upon - the basis by which many companies get hold of your details and use them to send you unsolicited mails, emails and even make unsolicited telephone calls to you. This kind of advertising is also prevalent on the Internet with what is known as 'pay per click' advertising. As a consumer you have the right to know where your details are being distributed to and as to what purpose they will fulfil when they get there. You also have the right as a consumer not to have your details passed along if you do not want to. However with 'Pay per click' advertising you will not be aware of any information being passed as it is all done behind the scenes and within code specially written into a website or webpage. How Can I Avoid Other Companies Getting My Details? Firstly - and this may sound a little too simplistic but it is important - always read any documents or paperwork you have been sent. Somewhere within the confines of the small print there will be a clause which states that your details may be passed onto subsidiaries, third parties and other interested parties selected by those who are in contact with you. This clause, although rather innocent looking, can cause no end of problems for you especially if you are trying to reduce the amount of junk mail you receive and also can be problematic in protecting your identity. It is important to remember that such data can - and is - sold for profit by companies looking to enhance their profits. Such data may sound non important to most of us but to companies looking to expand their customer base and to identity thieves it is the written equivalent to gold dust. The Mailing Preference Service (MPS) - just like its counterpart the Telephone Preference Service (TPS) - is a free service designed to help you reduce the amount of unwanted and unsolicited mail that you receive through your door. Subscribing to these services online can dramatically reduce the amount of unsolicited mail and telephone calls you receive and also prevents your personal details being sold on to so-called third parties without your permission. For more information on these services and also on how to reduce the chances of your details being passed on visit the Mailing and Telephone Preference Services' websites.